The Portland based beer and cider webmag The New School is celebrating their 5th anniversary this New Years Eve with a party at Bazi Bierbrasserie. 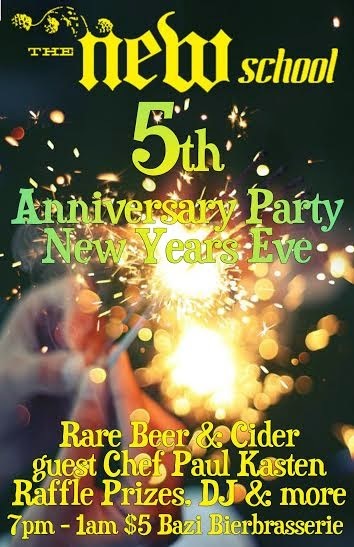 There bevrage list will include 10 rare beers and ciders, raffle prizes and food from acclaimed beer Chef Paul Kasten (formerly of Wildwood). This years party will be a charity benefit for Guide Dogs for the Blind. Pork Collar braised in wort and sliced into portions, served over roasted winter veggies simmered in the pork braising liquid, and fried sage. Raffle Tickets will be on sale for $2 with multiple chances to win everything from Double Mountain Kriek t-shirts, Allagash Brewing Hat, Portland Beer Week shirts and even the new book "Oregon Breweries" by Brian Yaeger, bottles of Barley Browns Chaos (limited to 666 bottles), the 2015 Oregon Beer Calendar, a coupon for one of the first Growler Works uKeg's and even a New Belgium Cruiser bicycle. Flanders inspired red ale matured in oak brandy barrels. Open fermented with our special blend of brewer’s yeast, two brettanomyces, and acid producing bacteria. A blend of five barrels matured 15 & 25 months in our wild cellar. Wonderfully complex malt body, aroma, and flavor with a balanced sour finish. A special alternate version of Burnside's medal winning Sweet Heat. This one with Carribean spices, Lime, Cilantro and Yellow and Red Peppers in addition to Sweet Heat's Apricots and Scotch Bonnet chili's. An Imperial Stout and Baltic Porter blend with Stumptown Guatemala Finca el Injerto coffee and vanilla beans. Imperial Dark Rye collaboration beer with Virginia's acclaimed Devil's Backbone Brewery. 7.2% ABV. This should be a great event and opportunity to support a good cause with a chance to try some rare and exclusive beers.